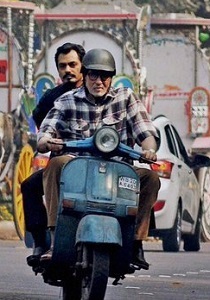 Review Summary: Te3N gives us a brilliant turn by Amitabh Bachchan and a slow burn thriller that ultimately fizzles. The slow-burning drama about crime, tragedy, guilt and retribution has the potential to repay the patience of those that don’t switch off their brains when watching a film. But even with the minor grouse, Te3n serves up enough thrills to hook you on. Director Ribhu Dasgupta's second movie is just about as good as taut thrillers can be. There's a directorial control and finesse that make this film engaging and well worth a watch. On the whole, TE3N, despite being a whodunit thriller, suffers extremely because of its slow pace and weak screenplay. At the box-office it will be unable to connect with its target audience. lashbacks play their part in both movies in reminding viewers of old wounds that refuse to heal. Kahaani’s deceptive rewinds greatly helped throw off audiences following present-day events, but in Te3n, the flashbacks only stretch a thin plot to an untenable 136 minutes. Like any thriller, the money here is on figuring out the perpetrator, hopefully before those hunting the person in the film can. Extremely Slow but Classic Performance and Intriguing story. It is a thriller with a heart, soul and most exceptionally, a conscience! Sadly, the slow pace, predictable twists and non-glamorous looks of the film, dilutes the intensity and might fail to connect with its masala loving film viewers. Amitabh Bachchan and Vidya Balan’s latest thriller is SLOW and TIRESOME! The protocol of making thrilling films have been compromised, which in turned has hampered the quality of the film in a big way. This has therefore hampered the review as well despite having some powerful performances from Big B and Nawazuddin Siddiqui in the film. But go for Te3n to witness the beauty of Amitabh Bachchan. He alone is reason enough! Lady police officer Sarita (Vidya Balan) assures him that they would contact him if they made any headway in the case but still, John visits the police station daily. Amitabh Bachchan, Vidya Balan and Nawazuddin Siddiqui deliver superlative performances! The movie doesn’t fully live up to that ambition, but the good news is that it’s just Bollywood enough to show you what deeply familiar thriller conventions feel like when they’re made with different spices. There are definitely more than 3 reasons to watch Te3n.